Basketball Goal Systems are not created equal. The Signature Series line of basketball goals by Goalsetter proves just that. 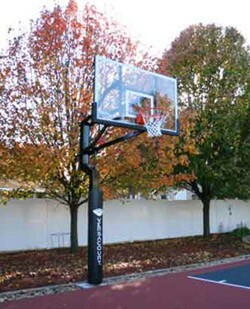 The Signature Series is the premier line of basketball goals for growing families and basketball purists. The Signature Series offers our exclusive features including the patented compression height-adjustment system, Tempered Glass or Fortified Acrylic Backboards, one-piece off-set structural steel poles and patented hinged ground anchors. 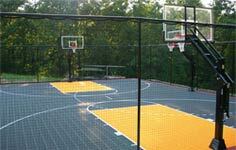 Choose from a complete line of basketball goals to meet your home-court needs. Give your young budding basketball star the edge he needs. Give him a Goalsetter® goal, the "Best in Basketball”. Give yourself and your family the practice tool they need to get on top of their game! It will give you many hours of safe, enjoyable and quiet practice. 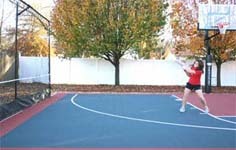 A rebounder is the perfect practice aid for you and your family to hone your skills. Kick soccer, pass the basketball, throw the baseball, practice your tennis stroke, whatever you want to do, the Rebounder will enhance the game. Tennis coaches praise our tennis rebounder system saying it is an excellent tool for young players to practice ground strokes by themselves, while providing for a good physical workout at the same time. This multi-functional training aid is perfect for single person practice of tennis & other sports. It gives very realistic ball response and allows the player time to set up and react to each shot much the way they would do in a real game. Ball Containment Fencing is visually appealing and safer than chain link and offers a forgiving resistance when impacted by aggressive play. Built to withstand any environment, our netting is highly functional and visually superior to other fencing. The nylon netting virtually disappears from sight without obstructing your background landscaping. Available in 6ft and 10ft tall heights.